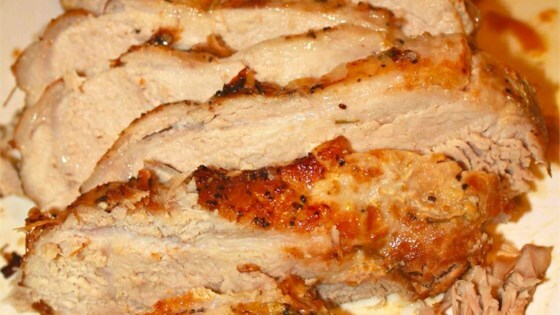 "This pork loin is baked in an orange soy concoction that results in an awesome, tender and flavorful dish." In a medium bowl, stir together the orange juice, soy sauce, olive oil, red onion slices, rosemary and garlic. Place the pork roast in a baking bag, and set in a roasting pan or baking dish. Pour the orange juice mixture over the roast, making sure to coat entirely. Close the bag according to package instructions. Bake for 2 to 2 1/2 hours in the preheated oven, until the internal temperature of the loin is at least 145 degrees F (63 degrees C). Remove from the oven, and let stand for about 10 minutes to settle the juices. Carefully open the bag and remove the roast. Slice and serve with a little of the drippings drizzled over.